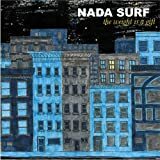 My first and only thing I remember about Nada Surf was their moderate hit �Popular� back in 1996. After that, I assumed that they disappeared off the face of the earth for good. Maybe they did and I haven�t followed up on them, but I do have to say I was surprised and impressed when I heard this album. Not only was it nothing like the only song I heard from them to begin with, but it was actually good. This album has many great poppy catchy songs, it reminds me a lot of Death Cab for Cutie�s Transatlantacism, but does have it�s own flare. It will definitely get more listens and I recommend it to anyone who wants an alt/pop album that they can take seriously but still enjoy.